Rose Corcoran Writes: The Great One-Day Valentine's Giveaway Blitz! The Great One-Day Valentine's Giveaway Blitz! People do indeed do crazy things this time of year. Maybe it’s the flowers, chocolate, and excess of pink and red, but Valentine’s Day is one of my favorite holidays! I might be biased because my birthday is the day before Valentine’s day, but to me, this has always been a wonderful day of love. So today, of all days, I have decided to spread a bit of that Valentine’s cheer by offering an ebook one-day giveaway blitz. That is, until midnight tonight (United States, Mountain Standard Time), everyone who enters will receive an .epup file of both of my books, free! 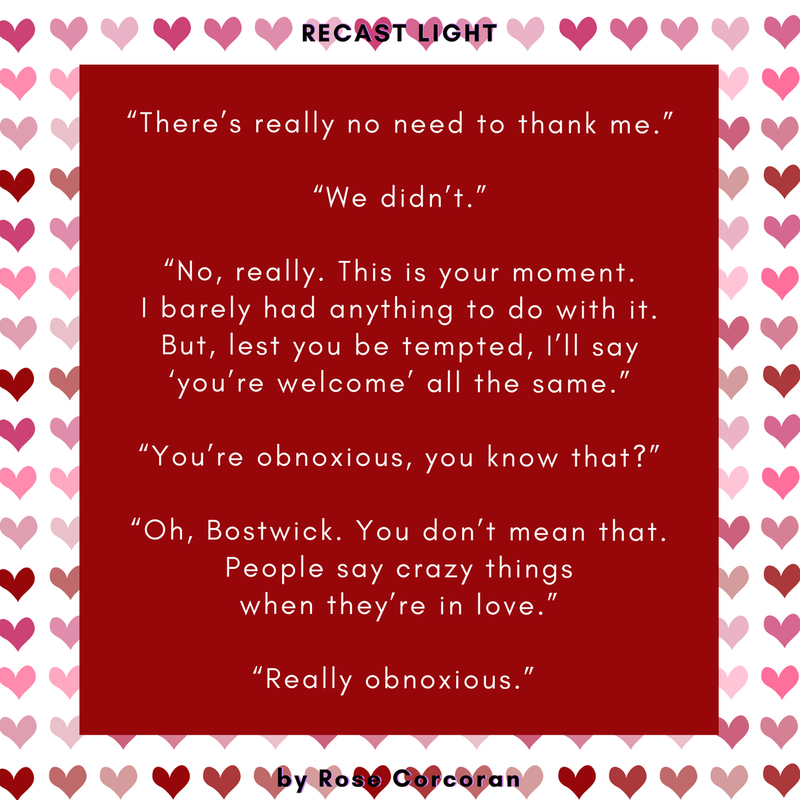 · Because I want more reviews of Outcast Shadows, in order to generate interest in Recast Light, and in order to get those reviews, people will have to have read Miscast Spells. · Because setting a period for free e-ARCs seems to be popular nowadays, and even though I missed that boat, it’s still good advertising for my third book. · Because .epubs cost me nothing but the sale of a book; they are cheaper than my having to pay for a paperback and postage. · Because I’m the author and it’s my post-birthday and I can do what I want! To enter, simply email me at rosecorcoranwrites@gmail.com, with the subject line saying you want the .epub; the body of your email must prove to me you are not a spam bot, but a real flesh-and-blood being, or at least a robot with kokoro. If you already have Miscast Spells and want only a free Outcast Shadows, just let me know in your email. At midnight, the giveaway will be over, the spell will be broken, and I’ll reply to your email by attaching the .epubs. Note that because I can’t seem to attach the cover to Outcast Shadows .epub the way that IngramSpark does, it’s not quite as fancy as the one you would buy yourself (though I will attach the cover image to the email). All I ask in return—all I ask—is that you honestly review both books on Goodreads, Amazon, and if you’d like, Barnes and Noble. Think of it like giving me a White Day present in gratitude for my Valentine gift to you.